The ancient Japanese medical book states that there were only 404 kinds of illnesses. I learned about it when I was still a schoolboy. Most illnesses were treated simply with Chinese herbs and the recovery rate was great. But what is going on with the medical science despite modern medical technologies that are being implemented to combat today's uncountable number of diseases? Of course, there are many factors involved in getting incurable diseases or diseases of unknown cause. Stresses are becoming more common because of the global economy. You are somewhat controlled to work under a certain programmed timetable from morning to night. Different types of stress surround us. Yes, we did not experience such stress when we were young. We believe that the foods we eat nowadays may not be the same as our ancestors. Don't you think that there must be a clue that could lead to the reduction of diseases we suffer today? By means of eating the same foods our ancestors enjoyed, we might be able to avoid contracting modern incurable diseases. If we can do something to reduce the stress, then the illnesses we worry might be counted back to 404 again. Fortunately, my wife and I have learned a lot of cooking techniques from our mother and have kept cooking technologies of old delicacies. Yes, these foods are very different from modern foods that young generations enjoy to eat such as instant foods and in fast foods. If you open the book of old Chinese delicacies and herbal foods, you'll notice that they are mostly dried and fermented. They really taste good, yet why today's young generations do not enjoy them? People today like to eat soft and instant foods. No teeth to bite? That's what doctors are pointing out today. As a small boy, I used to work hard in chopping radish, carrots, cucumber, melon, squash, and many other farm crops during the 1940s up to late 1950s. Today, our PYRO-ENERGEN members and my family still continue to dry these vegetables. Dried vegetables are not only delicious but also nutritious. Is it not the reason that all of us can maintain good health? Of course, we know that it is not only foods that maintain good health. Health condition varies depending on the environment, working condition, stress, financial condition, social condition. But please remember that food is still the main factor. Daily food practically controls your lifestyle according to our survey. Here's one easy way of making fermented drink that can help lower your cholesterol, blood sugar, fat, and make your skin smoother. It can also eradicate your problem of constipation in just ten days. This drink is not only for adult but can also be consumed by children. It was our healthy drink in China, Korea, and Japan. Today, young generation are forgetting it although it is still quite common in Japan. 1. 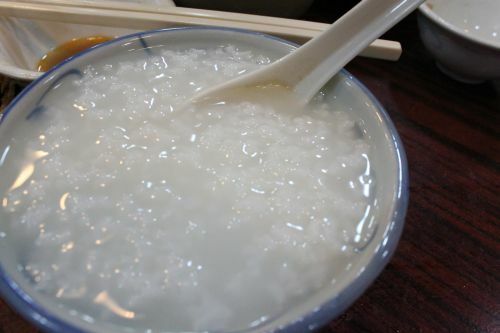 Cook a grip of rice with water to make a congee like the photo below. 2. Keep this in a plastic or glass cup, and spray a pinch of yeast. (Use the same yeast that you use when baking bread. Available at convenience stores). 3. Keep the congee in a glass cup and close it air tight or cover it with wrapping materials such as poly bag for about three days at room temperature. 4. After about 3 to 4 days, the congee will look melted or waterish and will smell alcoholic, a sign that it is turning to wine. 5. Now, you can make it warm with honey or syrup or sugar. Then, it will turn into a tasty wine-like, milk-like, or yogurt-like healthy drink. Enjoy from young to old and be healthy. People in Mongol, China, Korea, and Japan, enjoy drinking this throughout the year. There's nothing to worry about this drink since you won't get drunk. Once you'll get used with fermented sweet rice drink, your health will be greatly improved. You may even look 10 years younger than today. It's guaranteed according to medical analyses. About 10 years ago, I discovered that the same drink has existed especially among the elderly in the Philippines, Thailand, and other Southeast Asian islands, too. They call it simply as "Rice wine". Yes, people who drink this do live healthier and longer than average natives, just like people who practice drinking yoghurt.